Two knockout artists head to Arizona to put on a show for the first UFC on ESPN event. Vicente Luque and Bryan Barberena have a combined 17 knockouts out of their 32 wins and both men are confident of adding to their tally. Luque’s only loss in his last eight fights was to the currently ranked #9 welterweight Leon Edwards. He lost a decision but apart from that he has looked exceptional, finishing his last seven wins (four knockouts and three submissions) including big names such as Belal Muhammad, Niko Price and Chad Laprise. The dad bod of Barberena is deceptive as he is very explosive and powerful. He is also a natural finisher but has had winning streaks interrupted by decision losses to Laprise, Colby Covington and Leon Edwards. He is coming off a brutal knockout over Jake Ellenberger and although the veteran’s chin had already gone before the fight, Barberena’s power has to be respected. Both men are going to look for the finish with the preferred option being a knockout. They obviously have the power so their defence will be crucial. 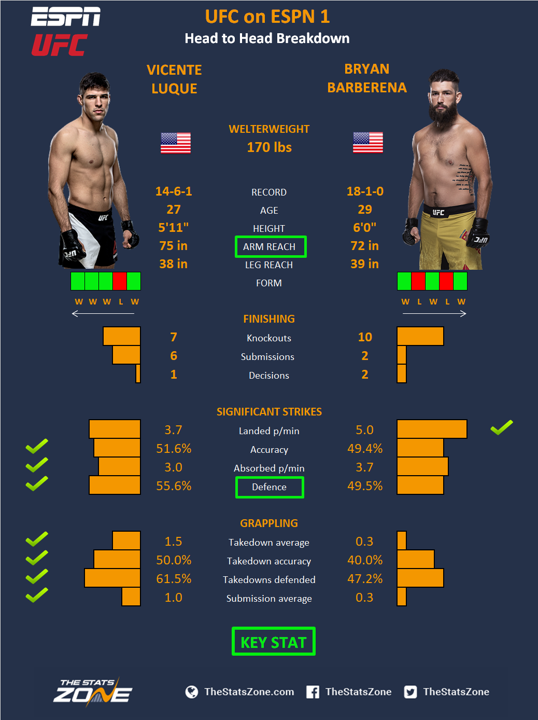 The edge has to go to Luque however as he has proven wins over top competition and has better rounded skills to mix it up if Barberena starts to land. Barberena is always capable of a finish but Luque has more in his locker and will likely to continue his rise up the welterweight ranks.